Spencer came running into the house, this morning while I was getting around to go outside. 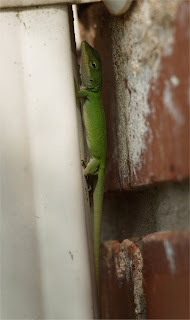 He was all excited and told me that we had a baby lizard on the house. Quickly I found my shoes, and grabbed the camera to snap a picture. It looks like we might have a whole family living either in the gutter or under the ground by the gutter.